Exquisite print experiences. Timeless craftsmanship. Ink. Paper. Pressure. Know-How. Exceptional Results. At Old North State, we specialize in custom letterpress invitations, business cards, stationery, and distinctive marketing materials. We enjoy working with designers, individual and commercial clients to produce the distinctive results only achievable with letterpress. Helping you stand out for over 20 years. Say it with your unique style. From custom invitations, to elegant, personalized stationery, we are focused on ensuring your experience working with us is as memorable as the results. Elevate your brand. Every printed piece is an opportunity to express and reinforce your core values. We work with small businesses, non-profits, institutional and corporate clients to support their distinctive printing needs. Through our in-house capabilities and network of partners, we offer a full range of printing and finishing capabilities to meet every need. Bring your ideas to life. In addition to in-house design services and expert support, we have an extensive network of collaborators, including artists, designers and illustrators, tuned to the letterpress printing process. Print Shop and Design Studio. Our studio is home to all the trappings necessary to achieve the distinctive results you expect from fine letterpress printing. The workhorse of our shop is a 1964 Heidelberg 10x15 "Windmill" recently restored from the ground up. In addition, the shop includes our first press, a Vandercook No.3 cylinder press, 2 Monotype Thompson Sorts Casters, and our most recent acquisition, a second Heidelberg 10x15. As we can't stop ourselves, we're always adding new equipment to expand our capabilities and better serve our clients. Should you find yourself in Union County (south of Charlotte), drop us a line! DEDICATION TO THE CRAFT. PASSION FOR RESULTS. At Old North State Press, we are dedicated to preserving the tradition and craft of fine letterpress printing. We started our journey with the acquisition of a simple cylinder press over 18 years ago. The studio now boasts an impressive array of heavy, outdated machines and equally obsolete related equipment, all meticulously maintained and loved. 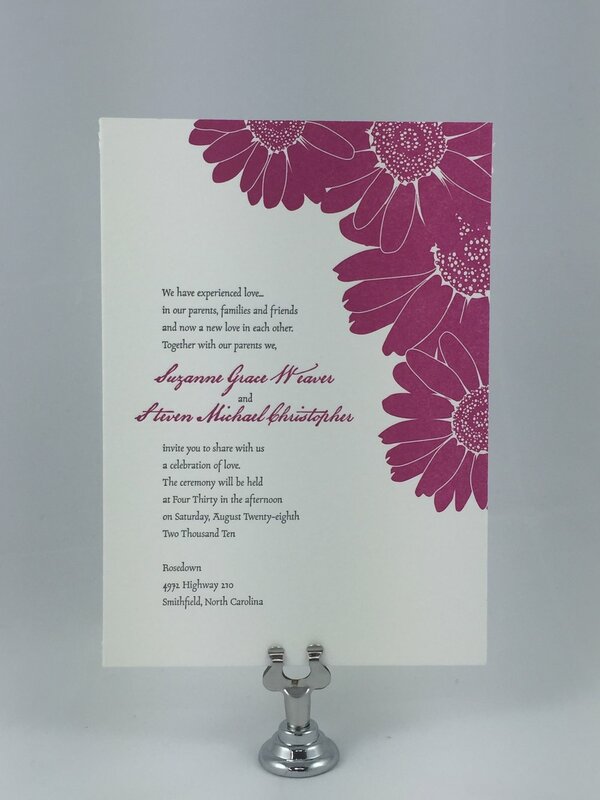 In addition to supporting custom client work where the unique characteristics of letterpress printing is desired, we produce original designs for stationery, note cards, wedding invitations, birth announcements, broadsides and other printed matter. Above all, we most enjoy collaborating with our clients and other designers to make beautiful things. 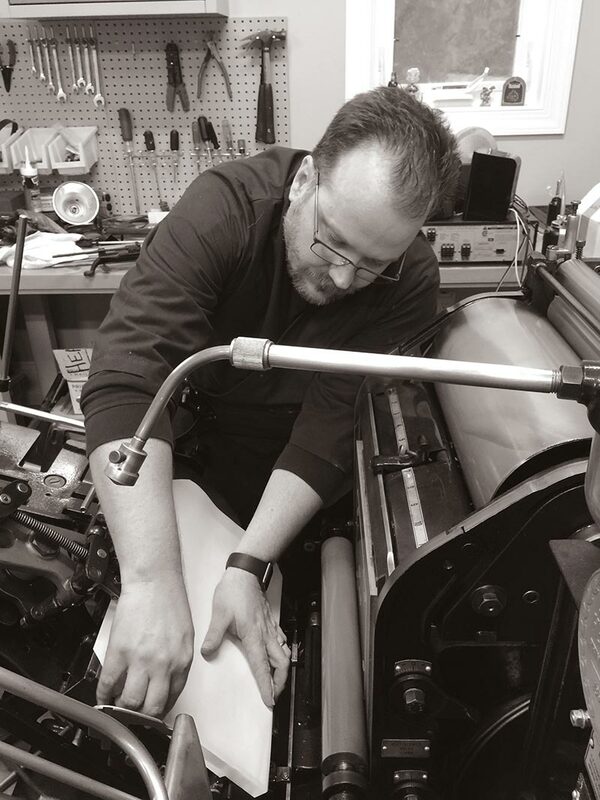 Chris is a classically-trained designer and typographer and self-taught pressman. He completed his MFA in Design at Yale School of Art in 1995 where he was first introduced to traditional printing methods under the watchful eyes of Howard Gralla and Greer Allen. Chris enjoys fretting over the details and coaxing beauty from these iron beasts. Danielle is a fearless editor and etiquette expert. She has a Masters in Communication and has lived in the South longer than she hasn’t. Danielle has a keen eye for fine presswork and ensures every piece we produce measures up to our exacting standards. Since "the incident," Murphy is no longer permitted in the studio.